How are you all?Well I have been very busy this week with some family stuff but now am back for Friday.Thats why I am here to do a review that was requested by a couple of you pretty ladies.The product is Oil Of Olay Beauty Fluid. The legendary first product introduced by Olay, Active Hydrating Beauty Fluid continues to make women look and feel beautiful today. It penetrates skin quickly, providing it with an immediate surge of active moisture that soothes dryness without leaving behind a greasy feel. This hydration works like the essential fluids that are abundant in young skin and helps diminish the appearance of fine lines and wrinkles. 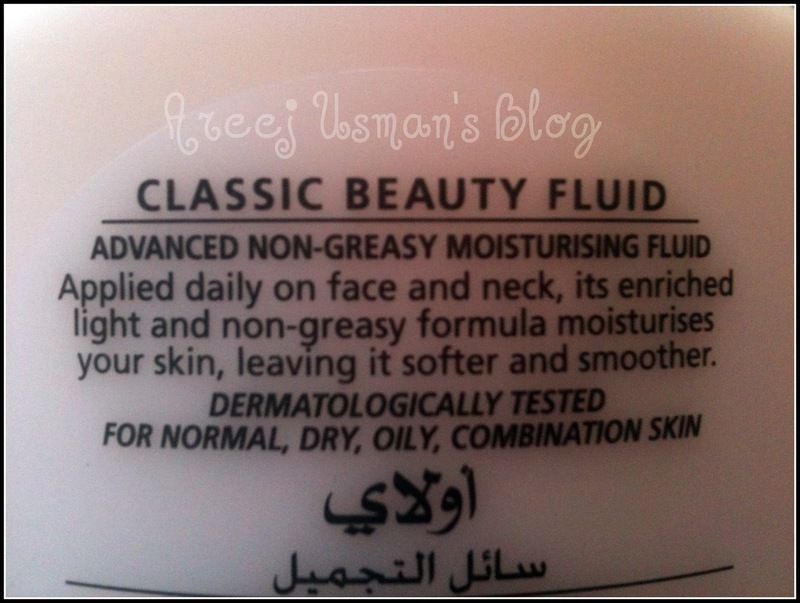 Before I share anything about my experience with Olay Beauty Fluid I would like to share some info that I came across that I thought interesting enough to be shared with all of you! Oil of Olay Beauty Fluid was a product truly born from love, and it was created by a man as a gift for his wife. In the 1950s, chemist Graham Wulff saw his wife Dinah’s frustration with the thick, waxy beauty creams that came in shoe-polish tins. They left her skin looking greasy, and they certainly didn’t fit with her feminine sensibility. Graham wanted to create a new beauty product for her – one that could not only moisturize her skin, but also leave her feeling beautiful and feminine. Eventually, after much experimentation with absorption and texture, the legendary Oil of Olay Beauty Fluidwas born. And within five years, Oil of Olay Beauty Fluid was enjoying phenomenal success in South Africa, and in 1959 they expanded into England, the United States, the Netherlands, Canada and Germany. Nowadays, Oil of Olay Beauty Fluid reportedly sells one bottle every 4 seconds somewhere in the world, millions of women worldwide cannot all be wrong. This legendary first product, Oil of Olay Beauty Fluid, continues to make women look and feel beautiful today. Ok so I would start by telling you that this is the one product that literally RUNS IN OUR FAMILy! !My mother(MAY HER SOUL REST IN PEACE AMEEN) used this for her daily routine skincare & thats why its a product that I have been using for quite some time now.You can say while I went to school I used this.Even a childhood friend of mine remarked once that the smell of Oil of Olay reminded her of me ! I have been using this as part of my daily skin care for quite a span of my life now.Every morning after I wash my face I apply it.It quickly absorbs into my skin leaving behind a moisturised & soft skin.Though I have oily skin but it has never left that greasy feeling on my skin.Its hydration also helps in keeping the skin young & diminishes appearance of lines.This moisturiser is for all kinds of skin so I would say that If you have had trouble finding a moisturiser for daily use that would suit your skin go ahead & try this Beauty Secret that woman have been loving for some years now! Sometimes I dont want a heavy make up look so instead of using a foundation or sheer tint moisturiser I simply apply Olay Beauty Fluid to my skin & proceed with a face powder & that does the trick for me.If you have a blemish free face without any marks that need to be covered with foundation you can also choose this fluid as a base for your makeup. Likewise if you are a at home & dont intend to go out all day simply use this fluid to keep your skin moisturised all day long.Try it and you will be very happy with the results. I would recommend this product to all the ladies with different skin types to include this Beauty Secret into their daily skincare regimes.It will leave your skin soft,supple & hydrated & you will feel the positive results on the outside too.Its one of the best moisturisers I have come across in my life! It is easily available at all leading cosmetic stores & chemists in Pakistan.The prices can vary place to place.I got it for Rs.650 from D.Watson Blue Area Islamabad. Do share me your thoughts if you have been using it or any other Olay products. Comments & Queries are always welcomed. Aww…Thanks a lot for the review Areej.Olay has been a favourite of mine for years now and is a staple in my bag..I just love everything about it – the mild fragrance, the softness it gives to the face, kinda glow etc etc. Nice review. I had been planing to buy it and now i will! I'm so so sorry to know about your mother Areej. may her soul rest in Jannah. It was my mother's favorite too. But I think there may have been a slight change in the formulation. Maybe I'm wrong but I do remember ami's bottles long ago were made of glass and the scent was exquisite. It smells different now somehow. Great review. Also try their creme ribbons body wash. Very moisturizing in the shower.